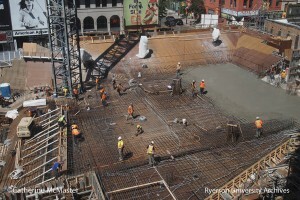 Ryerson’s campus is a work in progress. 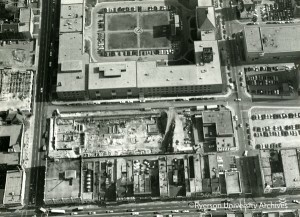 Since the school’s inception in 1948, it has been slowly increasing its footprint in the downtown core through acquisition, demolition, renovation, and original construction. 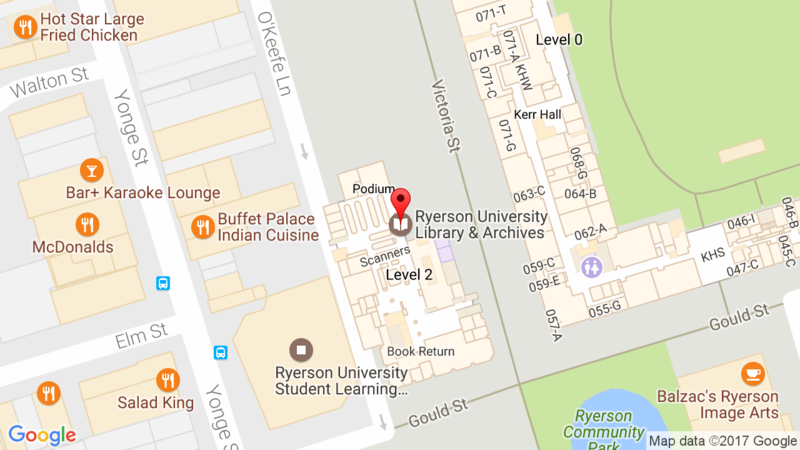 From the original Department of Education Buildings the campus has pushed East to Jarvis Street, South to Dundas Street, West to Yonge Street with the new Student Learning Centre, and further West with the Ted Rogers School of Management at Bay and Dundas Streets. The following photographs are highlights from the new Archives and Special Collections exhibit documenting Ryerson’s 66 year evolution. 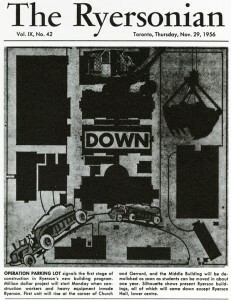 Ryersonian front page news story about the start of demolition and construction for Howard Kerr Hall. Demolition of buildings along Victoria Street, making way for Unit 1 (Jorgenson Hall) and the Podium building. The Library site has not yet been cleared. 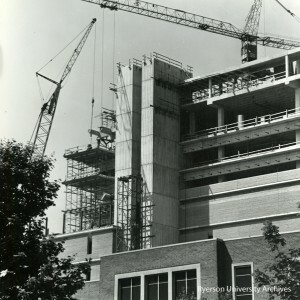 Contruction of Jorgenson Hall and the Podium Building. 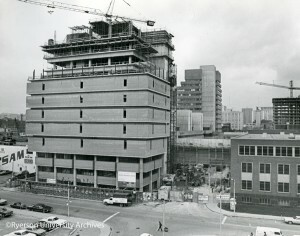 The Library building under construction. You can see the Sam the Record Man building in the bottom left hand corner of the photo. 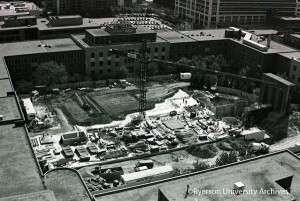 Construction of the Ryerson Athletic Centre (RAC). This was Ryerson’s first green roof building. 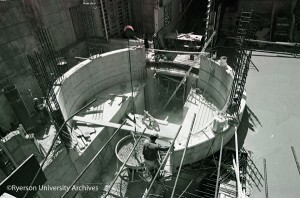 Construction of the rotunda at the front entrance of the RAC. 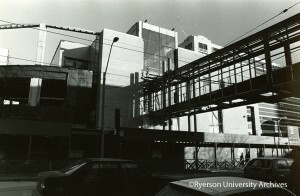 Patrons will eventually enter into the building through the facade of the old Ryerson Hall Building. The Rogers Communications Centre and bridge over Church Street. The bridge connects the RCC with Howard Kerr Hall. 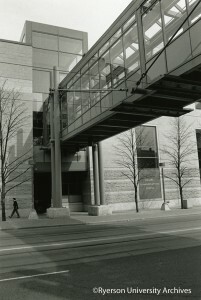 Completed bridge between Howard Kerr Hall and the Rogers Communications Centre. Construction workers pouring concrete for main floor of new Student Learning Centre. 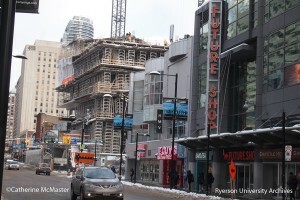 The changing corner of Yonge and Gould Streets. The exhibit runs from April 11 to June 30th and is located on the 4th floor of the Library in the Special Collections windows. I attended RTA from 63 to 67 and was a faculty member in same dept from 80 to 07′. I’m writing for just one tiny reason..the fountain in the centre of the Kerr Hall quad. As a student I can remember it being a meeting place and a minor celebration of spring when it was turned back on for warmer weather. When I returned the fountain was gone as was the inner quadrangle parking for faculty. When construction started for the RAC there was a moment when many white hard hats collected around the excavator. From my office window it appeared that the fountain remains were an unexpected archaeological find…and then out they came.